I've had an ongoing issue with Mac users who are running SU2018. I still have not determined the underlying cause but when the user enters in their serial number it will not save. With SU 2018 the .plist file is no longer relevant and I think this may be why the plugin is having problems saving the serial number. For Mac latest OS, you hold down the option key and then click GO menu. The Go Menu displays. Click on Library and the hidden library folder opens. Then you can access application support, SketchUP2018/Skeetchup/Plugins/PrivatePreferences.json. OpenPrivatePreferences.json in BBEdit, add the license number and replace the word "TRIAL", then save your changes and open SketchUP 2018 and check the plugins license status in the global settings. I am currently working on a more permanent resolution for this problem. I sincerely apologize for the inconvenience this has caused some of our Mac users and I hope to role out a resolution with the next version release. 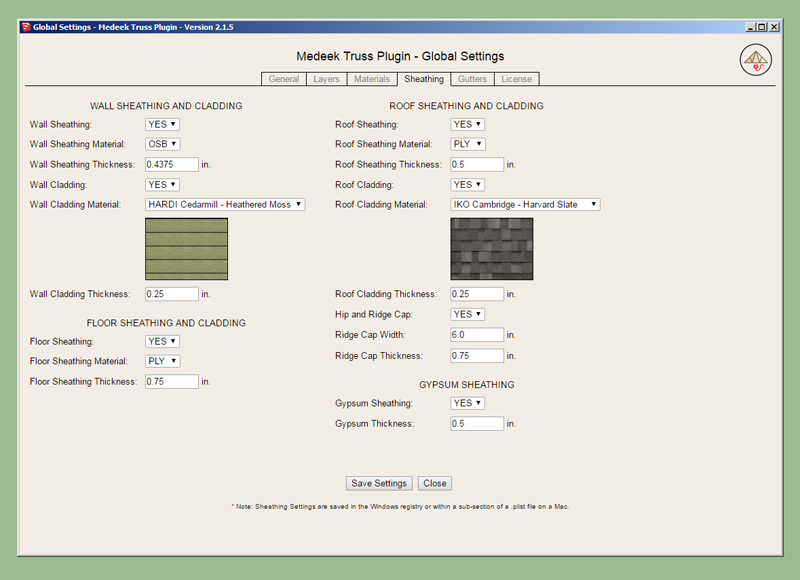 - Added a graphical user interface for (metric) advanced options of truss roofs. The advanced options have multiplied to the point that the simple UI doesn't fit on many smaller screens, hence I have been moving many of the larger menus to the html variety to remedy this. Additionally, the html menus give me the ability to customize the UI as much as I like and provide help text and graphics. Please download the latest sub-release 2.1.4c and re-install the plugin. I will slowly be switching to the new HtmlDialog which will mean that the plugin will no longer work on older versions of SketchUp (SU2016 and older). The reason for the switch to the new HtmlDialog from the deprecated WebDialog is the issues with modal windows (non-blocking) for the MacOS. 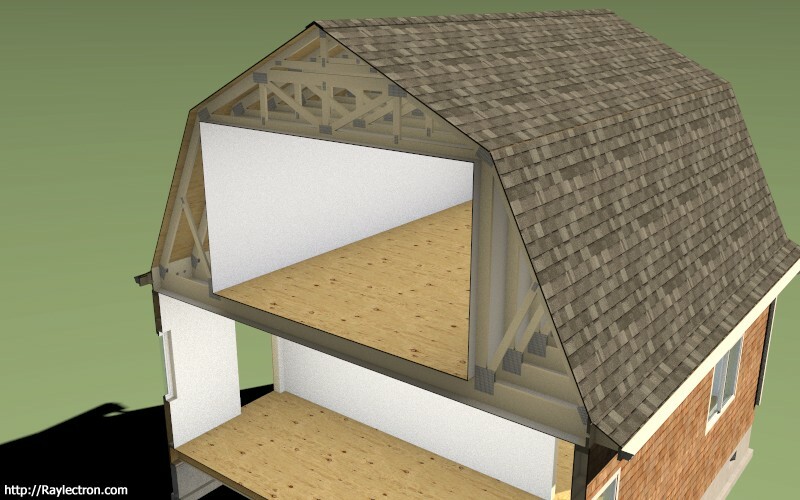 I've been making some progress on the advanced options for the gambrel attic truss. 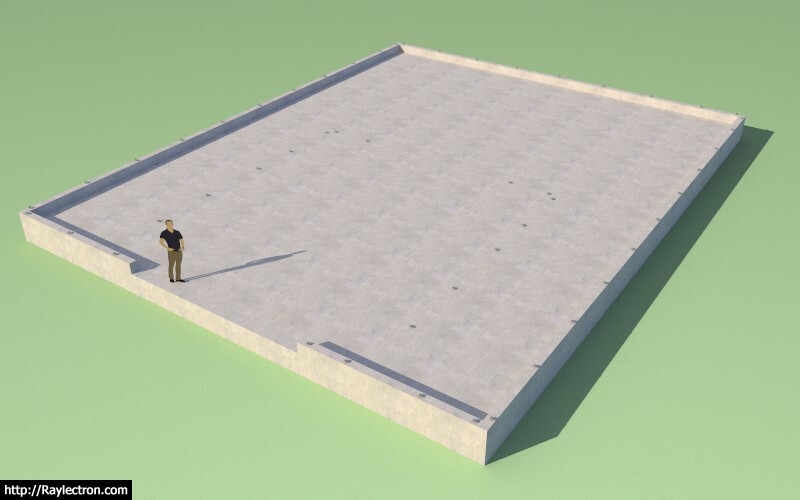 Since this type of roof has three different pitches it requires an entire rewrite of the advanced roof options module. 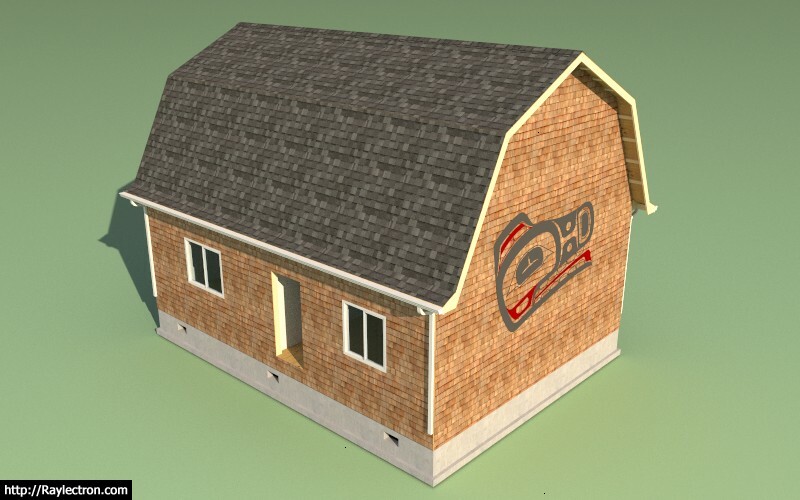 I am still debating on how best to handle the gable wall framing, same scenario for regular attic trusses, I may just wrap that into the upcoming wall plugin, I'm not sure yet. 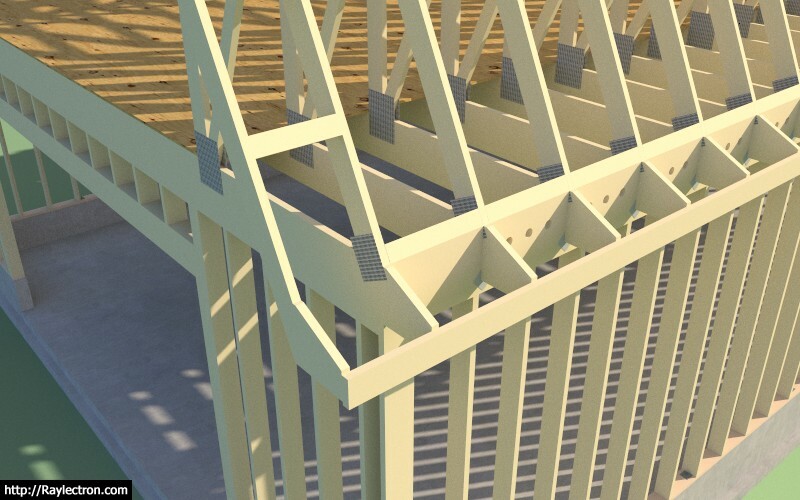 Even though this truss type is quite specialized it seems to also be quite popular hence my efforts to bring it up to speed with the common and attic truss. I am slowly trying to bring each truss type up to the level that the common truss type is and have all applicable advanced options available. 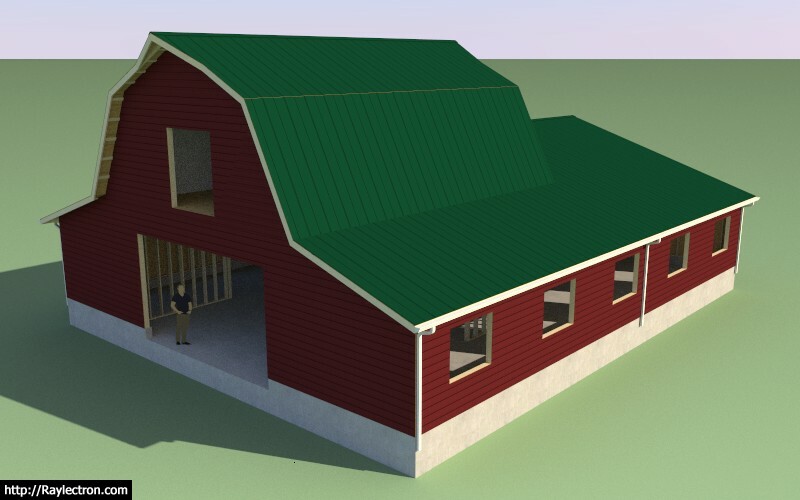 I have decided to eliminate roof returns for the gambrel attic truss type for now, at some later date I may entertain adding that feature in for this truss type. Knocked out the update to the cladding and ridge cap last night. I've released 2.1.4d so that everyone can test out the advanced options. All of the remaining advanced options (gutters, gypsum, heelblocks, outlookers) are now in place for the Gambrel Attic Truss, at least as many as I am going to attempt right now. I still need to figure out structural outlookers for this truss type so that permutation of the outlooker option will be disabled for now. Also note that for this truss type the heelblocking is only allowed to be vertically oriented, however I am willing to entertain angled heel blocks if someone can provide some form of documentation showing how they would be installed in a non-vertical orientation. I have a bit more tidying up to do with the new Html menu for this truss type and then I should be able to roll it out tomorrow or this weekend. 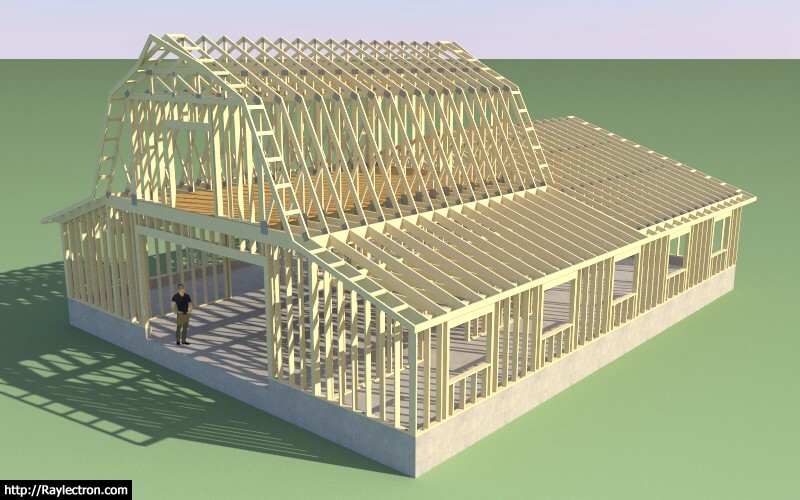 - Added floor sheathing and attic gypsum for gambrel attic trusses. 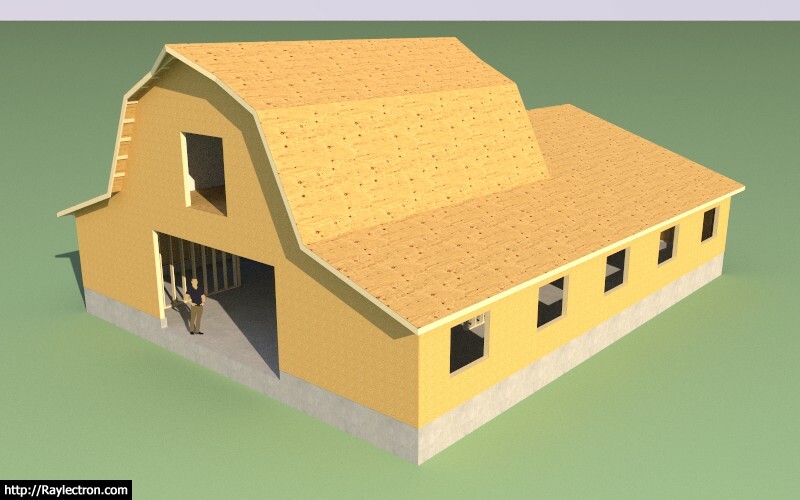 - Added roof cladding, sheathing and ridge cap for gambrel attic trusses. 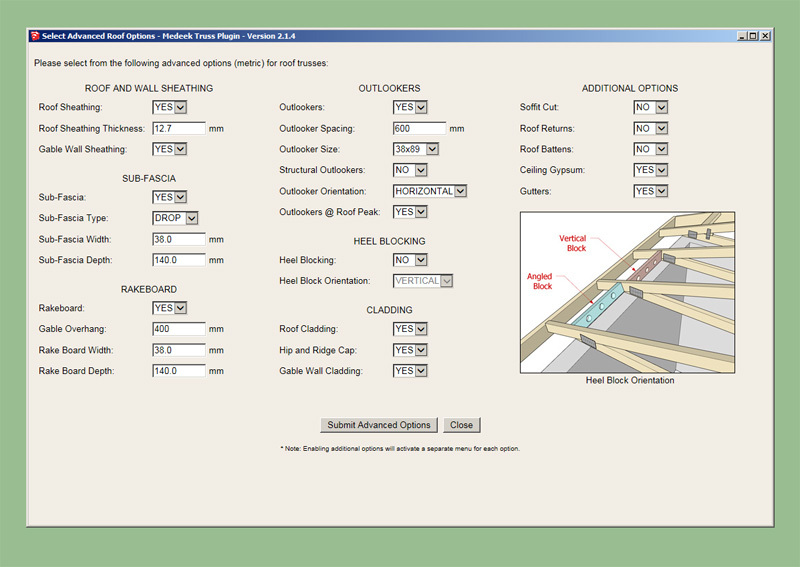 - Created a separate HTML menu for advanced options of gambrel attic trusses. 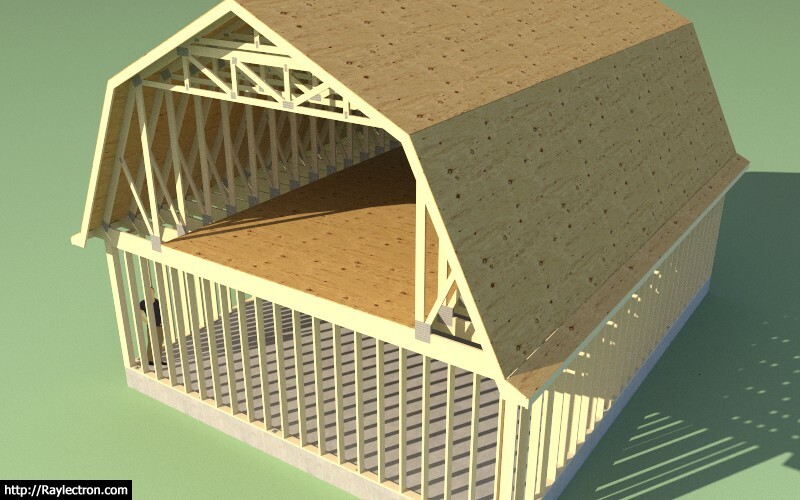 - Enabled gable end trusses for gambrel attic trusses. 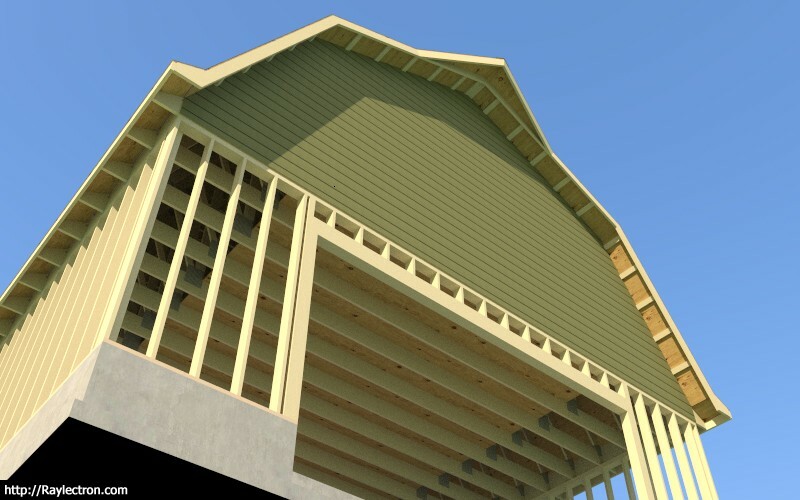 - Enabled hurricane ties for gambrel attic trusses. The crow's beak for the gambrel attic roof has been on my todo list for about a year and a half now. Grateful that I was able to somehow find the time to put this one together tonight. The projection of the crows beak and the length along the rake can both be set by the user. I will roll this out tomorrow as 2.1.5b once I've finished testing it. Foundation was created with the foundation plugin. 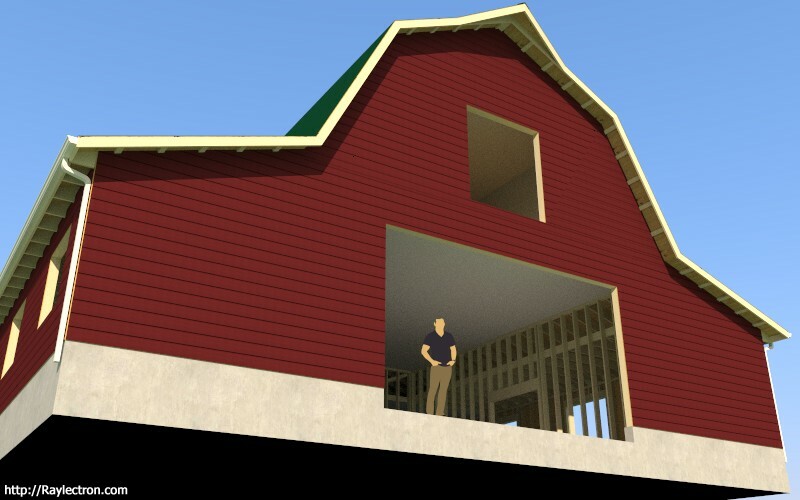 The thing I find very interesting with the gambrel roof is the two pitches, whereas with your typical gable roof you only have one pitch and each side of the roof is simply the hypotenuse of half the span and the height of the peak. With a gambrel roof you have the two legs of the roof and the two pitches and an infinite number of possible combinations and hence a large variety in the shape of the gambrel roof. Ultimately this led me to create the HTML/SVG preview panel so that the user can play with the various parameters until the desired gambrel shape is achieved. I believe this is where the real power in this plugin in manifest, in situations where an architectural element can be realized by incrementally adjusting parameters within the user interface. 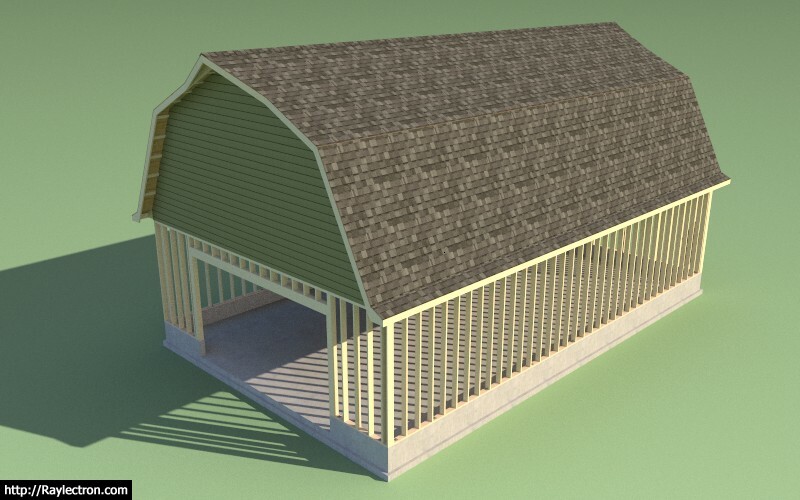 A common truss is much more simpler than the gambrel but a similar preview screen would be helpful in my opinion. 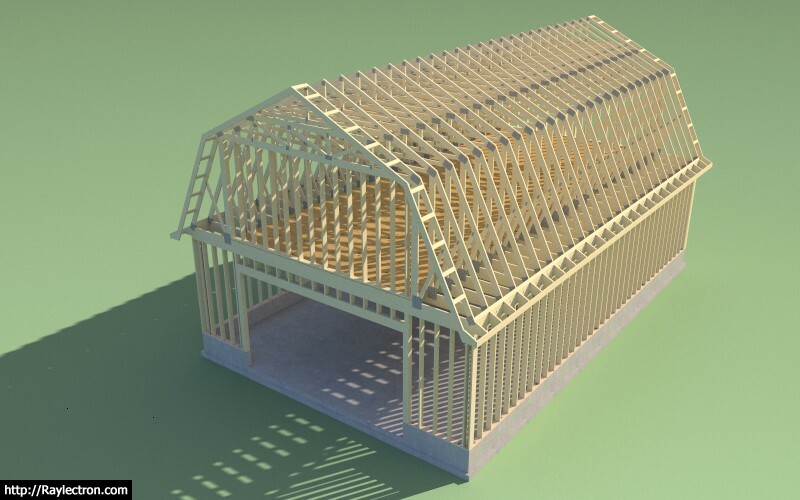 As I was creating the various test models for the gambrel attic truss yesterday I realized that the color I had initially set for the gypsum material was slightly off white, which for my particular case was just fine. However, after giving it second thought I realized that the gypsum color (material) should also be configurable so I added in one additional setting into the sheathing tab. Under the materials tab I will probably implement similar options where one can modify the color of the lumber and the pressure treated lumber. For now I will probably keep the plywood and the OSB material/texture as default. If someone really wants to modify those it is simply a matter of replacing the .jpg image with their own custom image within the plugin folder. The color boxes at the bottom of the color picker provide some shades of grey as well as the default Medeek colors for: lumber, pressure treated lumber, gypsum. This minor update is rolled into sub-revision 2.1.5c. I took a step back today and pulled my head out of the sand, so to speak. The truss plugin does some pretty cool stuff and its fairly detailed where I've fleshed out certain truss and roof types. However, it is missing one major feature or has a major flaw depending on how you want to word it. Currently the plugin is "fire and forget", with no ability to edit an existing roof or floor assembly. This needs to change. I have a mental picture of how I want to handle this but there may be some flaws with my thinking. My idea is to right click on a roof or floor assembly, then click "Edit Assembly" at which point the plugin will bring up a very concise list of parameters for the assembly. Changing any one of the various parameters or settings will essentially redraw the entire (roof, truss, floor, dormer) assembly. The list will remain open after each edit and only be closed if the user decides to close it. My original idea was to have the edit process walk the user back through each UI menu but this is too time consuming and probably unnecessary. Any manual edits made to the assembly will of course be lost but this is the price of having a fully editable assembly. I think I can implement this fairly easily, the various modules are all utilized the same as when I originally created the assembly, the only difference being the user interface. Making some good progress on the "edit" function. 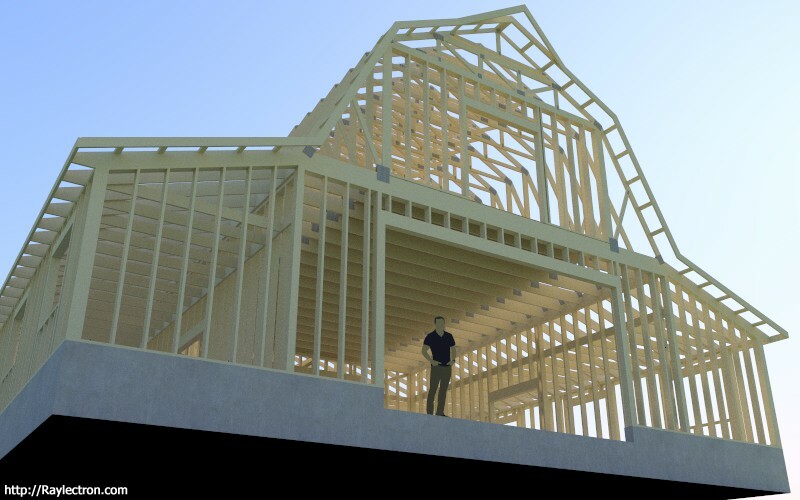 I will initially start with the common trusses and then once I am satisfied that those trusses are running stable I will begin to make this feature available for all other truss, rafter and floor assemblies.